Starting tomorrow half price at Tesco. Similar price at Morrisons if thats more convenient. Are the red onion ones £1 too? 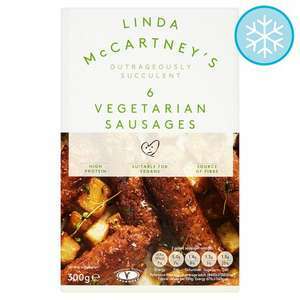 Love these, prefer them to meat sausages as they don't have a skin. Perfect for a butty. Top tip: smoosh em, make lorn shapes (thats a rhombus if you're English) and they're even more enjoyable. Just stick them in the microwave prior to cooking to thaw them out a bit, get the kids involved if you like, smoosh em all up. Fun and filling.